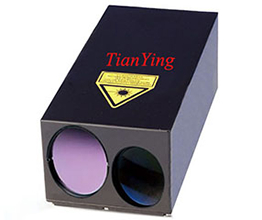 China TianYing TY-LR77 compact 12km-20km laser rangefinder module 1 Hz developed for observation platforms tasked to acquire small, moving targets, hence the 1 Hz continuous measuring rate and the extended range. They can find the range to small targets such as 5 square meter aero planes to distances up to and even beyond 10km. 1) Beyond 10km ranging capability of 30% reflection 5m² airplanes, beyond 15km ranging capability of 40% albedo 25m² target, up to 20km ranging capability of building/large craft.